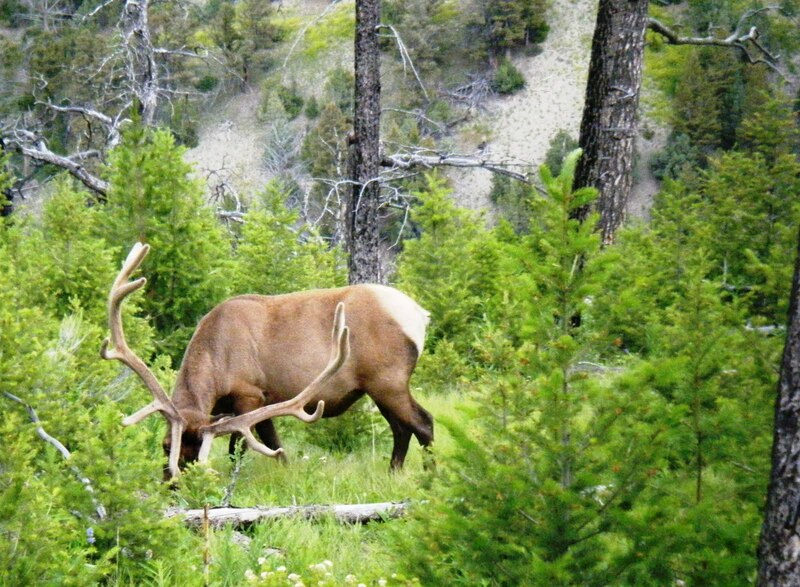 That photo is of a backcountry bull elk. It was taken by a friend of mine in a Roadless Area. Somewhere, deep in the timber, this buster is swelled up and running around trying to get as much tail as possible. He's what hunters dream about for 41 weeks out of the year.That Bull Elk is there because, long ago, Montanans made a pact to conserve and preserve the necessary habitats to ensure bulls like the one shown in the photograph, and roughly 130,000 of his kin, would always have a place to live. Elk need big, unbroken tracts of land; land without roads, and without the constant pressure that humans bring. Elk have a windpipe the size of a human’s forearm for a reason - they move quickly, covering lots of ground in a short time. They get away from you and me and anything that makes them uncomfortable. It's why we need big areas away from roads and development. Roadless Areas are a big part of what allows Montanan's to hunt 11 weeks out of the year (archery and rifle general seasons) on a $20 tag. In 2001, a huge step in elk conservation became the law of the land. The Roadless Area Conservation Rule was instituted by President Bill Clinton. The rule was instituted following one of the greatest debates this country has had concerning the value of wild country. Response to the Roadless Rule was historic. The rule received substantial public comment with 1.6 million people writing with 95% supporting the effort. Montanans wildly supported this proposed rule. At its heart, the Roadless Rule was simple: No more permanent roads in these areas. Keep what is left intact. Pay what for is essential, and decommission the rest. Solid, conservative and perfect for growing elk. Now, there are some folks whom one could naturally assume have never set foot in wild country, and who apparently lack an understanding concerning the importance of maintaining habitat functionality in Montana. Maybe some folks don’t fully understand that deer, despite what your Yellowstone tour guide may have told you (he was pulling your leg, by the way), don't grow up to be elk. Folks who do fall for this are often the same as those who introduce bills like the Wilderness and Roadless Area Release Act , or H.R. 1581. City folks, like Representative Kevin McCarthy, and, oddly enough, Montana's own Denny Rehberg, have brought a bill that does the exact opposite of what the Roadless rule did: H.R. 1581 will severely and negatively impact hunting opportunity in Montana, and across the West. HR 1581 would eliminate the 2001 Roadless Area Conservation rule as well as eliminate the administrative protections on critically important hunting grounds that are contained within Wilderness Study Areas. Proponents claim the bill will lead to greater access by the public, economic development andand a host of other benefits. Politically, the claim being made is that these areas have garnered neither wilderness designation nor a removal from consideration. On this, I completely agree. I would note, however, that there has been a concerted and forceful attempt to stall every piece of wilderness legislation in Montana since 1983. That is why there is a backlog; not for a lack of trying, but because some politicians wield public lands management like a battle axe. All one has to do is look at the current hysteria over National Monuments, Wilderness bills, or the Land and Water Conservation Fund. It’s next to impossible to pass any forward-thinking legislation. Assault on the conservation movement is in full swing back east, and here on the home front. This is not an ideological discussion about the issues facing the day, it is an assault on elk and it’s an assault on elk hunters. H.R. 1581 eliminates the most effective protection elk have when it comes to multiple use lands within the US Forest Service system. Real security habitat comes when elk can get away from roads, and find those dark holes to hide. No. It puts it back in to the hands of special interests who have little time or use for the conservation of wildlife, or public lands.